The University of Wisconsin-Extension “Check Your Free Credit Report” campaign’s website fyi.uwex.edu/creditreport lets you sign up for reminders to check your free credit reports and provides guidance on how to get and read your free reports. 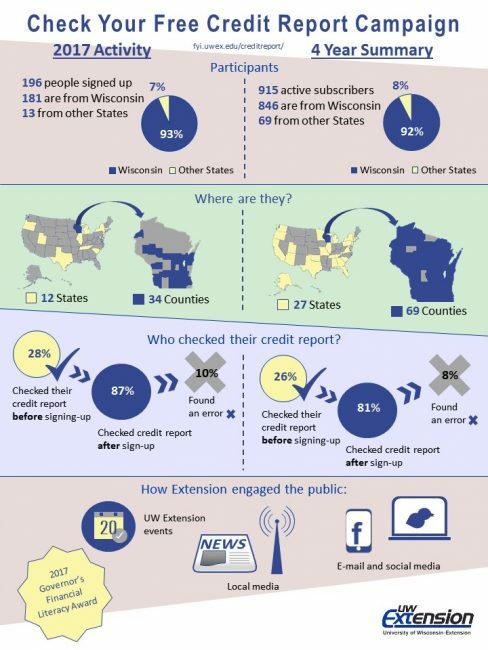 Since the reminder campaign started in 2013, many people have reached out to UW-Extension educators with questions about obtaining a credit score. The information in your credit report is used to create a number – or credit score – that lenders use to make decisions on whether to extend credit or what interest rate to charge. Referring to a score is easier and quicker for a lender than reading through an individual’s credit report history. Credit scores are created by private companies that assign numbers to financial activities appearing in your credit report, such as paying bills on time or opening up a new credit card. Typically, the higher the score, the better your credit. If you search the internet, you’ll likely get millions of results offering a free credit score. Many credit scoring services offer an “educational” score or letter grade that would not actually be used by a lender. To narrow down your search, a few options exist if you are interested in finding out what types of credit scores you have. Start by checking a credit card or car loan statement. Many lenders have started offering a free credit score. You can buy a score online from one of the three major Credit Reporting Bureaus – Equifax, Experian, or TransUnion. While you are legally allowed one free credit report from each bureau every 12 months, the bureaus do not have to provide a free credit score. 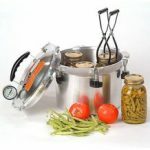 Individuals can also purchase a credit score from one of the largest credit scoring companies FICO®, or Fair Isaac Corporation, at myfico.com. FICO has many different credit score models, with some scores ranging from 200-900 and other scores ranging from 300-850. Many services and websites advertise a “free credit score.” Some sites are funded through advertising and don’t charge a fee, and they may sell your contact information to their advertisers. Other sites may require that you sign up for a credit monitoring service with a monthly subscription fee in order to get your “free” score. Be forewarned that some services offer “free” trials, but if you do not cancel within a certain time period, such as one week or one month, you will be charged a monthly fee on your credit card. If you are concerned about your credit history or will be applying for credit in the near future, you may want to check with a reputable non-profit counseling service listed at debtadvice.org or 1-800-388-2227. Many credit counseling services will be able to offer a free credit score, help you read through your report, and correct errors. at the official website AnnualCreditReport.com. Anyone can sign up to receive an email reminder from UW-Extension three times a year – February 2, June 6, and October 10 – on the campaign’s website at http://fyi.uwex.edu/creditreport. In addition to email reminders, the campaign’s website provides information and links for ordering, reading, and understanding your free credit reports. The website explains how long different types of credit information can stay on a report and steps to take to increase your credit score. While you can order all three reports at the same time, the Oconto County UW-Extension recommends that you view one report every four months so you can be sure that the information is up-to-date and accurate year round. For more information on credit reports, contact Jill Cholewa at jill.cholewa@ces.uwex.edu or 920-834-6848.